First off, I need help. Haha! As if most of you didn't know that already! ;) But, seriously, I really do need help....with Blogger. I have tried since the birth of this here blog to schedule posts, but they NEVER work! I write up the post, have it ready, click on "schedule", select the date, choose the time (and make sure it's EST), save and click "publish". Then that date and time comes around and NO POST. When I go back and view the post, it still seems to be "scheduled" but just never actually posts it! Has anyone ever had this problem? Can you think of a step I might be missing? I finally got an Instagram button on my blog, too! Look to the top-left - see the social media button with the camera on it? Click it and follow me there...it quickly became my favorite form of social media! 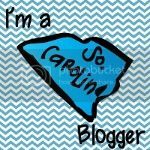 Today, I'm thrilled to showcase another budding blogger who can also claim to be a "Carolina Girl"...just a NORTH Carolina girl. :) I'm super excited that she will be coming to our Carolina Bloggers meet-up in a couple of weeks. 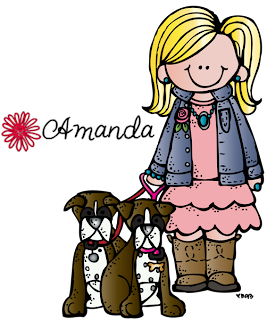 She just started blogging in June and is moving to a NEW school and a NEW grade level this year. That is a LOT of new, so read on to find out more and then head on over to her blog and show her some blog love, friends! I'm a 'second career' teacher. My first career was as a business analyst for a major retailer. When my hubby and I started a family, I left the corporate world behind and spent 10 years as a stay at home mom. Then when my children were all in school, and I was praying about what to do next, I had 'a God moment' when I knew without a doubt that I was being called to teach. I had dreamed of being a teacher when I was a little girl, and I feel like God brought that dream back to me when I was ready for it. My Christian faith is a huge part of who I am and drives much of what I do, and for me, teaching is a way to live out that faith. My husband and I have been married for 19 years (woah!) and we have 4 great kids! We also have a beloved Goldendoodle named Maia (she has the SWEETEST nature of any dog I've ever met...I'm a little biased though). I grew up, and spent most of my life in Southeastern Wisconsin and moved to North Carolina in 2011 when my husband changed jobs. We miss our family and friends in WI, but love the new people and places we've been introduced to in NC! My favorite subject to teach has to be reading. I love to read and spend a lot of my free time with a book in my hand (I was one of those kids with the book and flashlight under the blankets). One of my goals as a teacher is to instill my love of reading in my students. I really enjoy introducing them to new books and series. Last year my second graders took one look at the Boxcar Children's book that I was about to read to them and made comments like, "That looks lame." and "It's really old! ", but every one of them was sitting SILENTLY with their mouth HANGING open by the end of the first chapter. The next week when we went to the library, a lot of Boxcar Children books got checked out! As far as my teaching style, I'm happiest when my students and I are working together toward a goal, and I like to make learning as authentic as I can. One of my FAV classroom projects reflects this...Measurement Murals. This project was the final assessment for our 2nd grade measurement unit. We started out by talking about the project and what the kids needed to do to be successful. Then we formed groups and had planning meetings where the kids decided who was going to be responsible for what. Each group had to agree on their plan and write it down so they would be accountable. After that, they got to work (and I got out the camera)! and drew the shapes they needed. and used resources to help explain their ideas to others. each person adding their part to the final project. Everyone worked so hard, and finished their pieces of the mural right on schedule. I was SO happy with the final result! Those 'best' days are awesome, but we all have 'those' days...the days when we feel like Viola Swamp on the inside, but need to look like Miss Nelson on the outside. Those are the days when I try to remember why I teach. Thank you for staying with me through this LONG blog post. 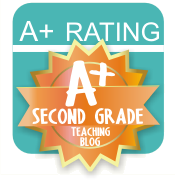 If you're anything like me, you could talk about teaching and your classroom FOREVER! 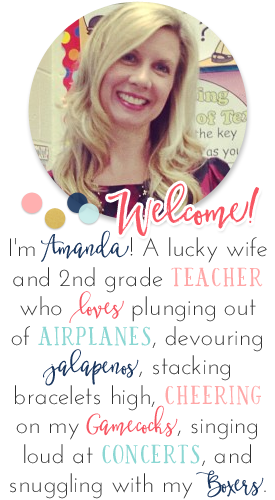 I'm looking forward to getting to know you through your blogs, and your comments on my blog! Hey Amanda! I also have trouble with posts not coming up as scheduled, you are not alone. I follow all the exact steps as well......then nothing, no post....not there, nada. So I wish I could help you but I am in the same boat my friend. Look forward to see if anyone has any suggestions. Hmmmm, I did scheduled posts this week and they worked...strange that it won't for you! :/ The first day I checked when I got up and it hadn't so I assumed it was the time difference. I went back to it and changed the time to an early time (4:00 am) and it worked. For the rest of my posts, I set an early time and they all worked.